I see a lot of mature runners in various states of disrepair in the clinic. Not surprising because the 40 – 55 year old age group is the fastest growing when it comes to taking up running, cycling and triathlon. They are not past it… they are just starting it. And many do very well. Back in 2014 according to Strava released figures the average 40 to 49 year old age grouper finished the London marathon some 1 minute 33 secs quicker than the average 20 – 29 year old age grouper. Kudos. One of the top selling, and most recommended, books about running is Born to Run by Christopher McDougall. At it’s heart is the authors relentless desire to discover the art of injury free running, and one of it’s main tenets is indeed that we are “born to run”. Uniquely adapted as a bi-pedal hominid to cover long distances at a canter…. sorry, jog. McDougall recruits the Harvard University evolutionary biologist Daniel Lieberman to explain to him about our hunter-gatherer heritage and how out of synch we are with our bodies inherent physicality. Lieberman says “humans are well adapted to run into late middle age”. He went on to write his own book, The Story of the Human Body. You should read it. And here lies problem number one with mature athlete injury rates. In paragraph one I told you they are STARTING running in later middle age. That’s not the problem… the problem is that they stopped. They should definitely still start, but the longer they have stopped then the more injury risk they are taking on. However in the bigger scheme of things the starting is a much better option than continuing the stopping… if you want to live longer. What the stopping did though was interrupt your process of “hardening”. The body “work hardens” to any repetitive physical process by specifically adapting to that processes demands… be it laying bricks, cutting hair, or running. Stop and you “soften”. In terms of running, you erode the strength base, the structural integrity, the cardio-vascular fitness and even the muscle memory/technique. The “soft” you slinks about for a couple of decades and then catches a look at itself on a holiday video on Facebook, and proceeds directly to “Couch to 5K” via a spending spree at Sports Direct. And you chose wisely because built into the “Couch to 5K” programme is a little stand alone life gift called “Strength and Flex“. Do that, and do it very well, and I probably won’t be seeing you at the clinic. Don’t do it… you’ll eventually be along. If you are a returning mature runner and just try to “re-harden” by running alone, then you are making a mistake. Fuel up the new you with some decent helpings of strength and flexibility, as well as the running, and your muscles, tendons and bones will positively adapt to the loads and forces that you are going to expose them to. That’s biology that is. Once you are back on track and back in touch with your evolutionary athletic heritage you can go one of two ways. Commit to the Hunter Gatherer that resides within, strip to your goatskin loincloth, and chase down rabbits most weekends. Or join Park Run, buy even more lycra, and a Garmin. As of 2016 the C25K app has been used by over 5 million people. Park Run started in 2004 with 13 runners in Teddington… it has grown into an international community of well over 3 million runners. Then there’s the problem of how the mature athlete runs. The actual style, or technique if you will. If you are a bit professionally pompous like me, you will call it a Gait Pattern. With some further obsessing you will purchase a watch that has accelerometers, ANT+, GPS and GLONASS built into it, and become briefly interested in your dynamic running metrics. But generally you will just keep running the way you run. Which could be an issue, because it’s highly likely that you are trying to run like you did when you were 19 yrs old. Your individual motor programme for running was fully refined and established at that age. Basically when it came to running… you owned it. And in a way you still do. The mind still has the software, but the body no longer has the hardware. That deadly combination of motor memory and enthusiasm has you trying to propel yourself down the road like the magnificent gazelle you once was… but your more of a pit pony these days. So you are still trying to use big strides, stretch out that lead foot, hit out in front, reach. You hit the ground hard, looking for some bounce back, feeling your power, smashing the road into submission. Hard is good. You are a spring, you bully gravity as you drive up and down, you bounce. Bounce is good. You bound, you bash, and you bounce, because that’s what you use to do. It felt right back then so it must be right now. Wrong… very wrong. Get real, stay in the present. That was history. You have changed. I’ll list the differences. Now before you start spreading anti-aging cream on your Ryvitas please listen carefully… all of the above are perfectly NORMAL. In medicine telling someone that something is perfectly normal can come as a great relief to the someone. I find it is a ball ache, because most of the someone’s then totally ignore the normal thing and do nothing about it. The list might be normal but don’t ignore it is a better message. In this case stop trying to run like a 19 year old and start running like a 50 year old. Which right now you are thinking doesn’t sound like a positive message. To help you visualise my message I am going to talk Video Gait Assessment. I film athletes all the time and I can slow motion your frontal plane pelvic stability like Speilberg. But for many of my mature runners they stare at my flat screen and ignore my sciencey ranting because they are seeing a different and more powerful message… “is that really me”. The digital mirror can be cruel. But the outcome can be positive… that is you, so let’s do something about it. 1) Increase your cadence. So that’s more strides per minute. Some folks call it increasing your turnover. 180 strides per minute (spm) seems to come in at number one on the hit parade , but I am a 185 fan. It’s a nice little cadence is 185 and gets you humming along and just sharing out some of those forces that come with an un-necessary boundy 170. 2) Decrease you stride length, which kind of comes hand in hand with increasing your cadence. The hard hit of the bound and bounce can come with going long in the stride department. Striding out doesn’t mean faster anyway because in terms of available energy its more expensive than just reigning in that stride length a wee bit. I’m not talking mincing along like a tiny Shetland pony, but employing a calm un-stretched trot. 3) Don’t over-stride and hit out front with your foot strike. Do that and gravity will fight back by putting the brakes on and shocking your system. 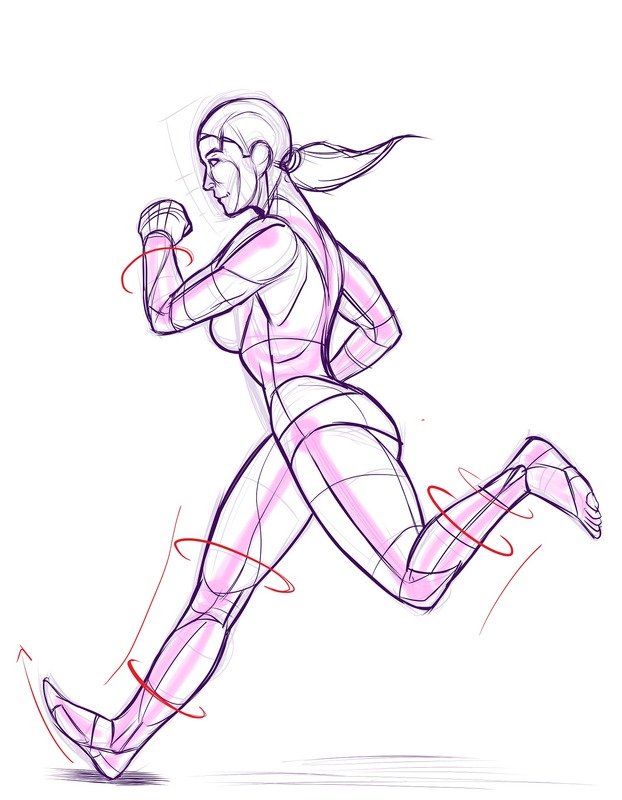 Doing the two tips above is the best way to calm down an over-stride, but you can have a go at doing it directly. Relax your lower leg at the knee during your swing through phase. Think of it hanging down a bit rather than shooting out into extension. Visualise your foot strike being more underneath you than out front… and it might happen. Smooth out the shock. 4) Think of Phil Collins. That won’t help your running. What I mean is, think of Phil Collins sitting in front of a concrete drum kit smacking out a beat with two fresh cod for drum sticks. That still won’t help, but if that’s what your feet sound like then you have issues. The noisy slap is not a sign of power. On the contrary, it is a sign of mushy weakness and potential tissue stress. Wasted energy spludging into the road. You need to do some strength work to tighten up your beats, but that is a given anyway. You could experiment in your running. Think quick ping rather than slow slap. Get your feet off the ground a little quicker. Feel them react and recoil to the surface. Listen for that change in sound. But that doesn’t mean bounce. 5) There is probably enough stuff bouncing around already. What goes up must come down, and it can come down quite hard. The down bit is the problem and most folks go down too far because they just aren’t as strong and inherently robust as they were. Mushy feet on mushy runners. As ever strength training is essential to iron out the mushy bounce, but you can try a trick or two. Stay tall as you run, think tall and look up, not at the 2 feet of road in front of you but something above the horizon. Think tall but not stiff. Relax. In fact, relax your face, un-clench your teeth. Think “tall and teeth”. That’s my mantra… tall and teeth. It keeps you up on top of your stride, and it might give your fishy feet a bit of ping. These are two simple recommendations but they are very effective. Don’t just think about how far and fast you are running, also think about HOW you are running… can you smooth out the physical stress? Compared to the other apes you have really long legs and short toes. This makes you pretty rubbish at climbing trees, but excellent at running. You are the “running ape”… it comes naturally. But if you have left running behind for a decade or so, please train and tread carefully on your return.